Today, I am participating in Foodie Friday at Designs by Gollum. I know, I know. How can I have the nerve to post delicious recipes when I'm supposed to be dieting? Well, I am still dieting, but because I have a passion for cooking and baking, it's difficult to not get in the kitchen and stir up some love. I will be honest, I did have one piece of this loveliness and it was DE-lish! (I had to sample it, right? How could I post this if I had no idea what it tasted like? Oh, how I suffer for my blog readers! ;) Heehee! In a colander, toss eggplant with 1 1/2 teaspoons salt. Let stand 30 minutes. Press slices between a double layer of paper towels to dry and set aside. Preheat oven to 400 degrees; place a rimless baking sheet or inverted rimmed backing sheet in oven. On a floured surface, roll out dough to 1/2-inch thickness. Sprinkle cornmeal on another baking sheet or inverted rimmed baking sheet or lightweight wooden board; top with dough (you will transfer it onto the preheated sheet to cook). Brush dough with 3 tablespoons oil and sprinkle with 1/2 cup cheese. 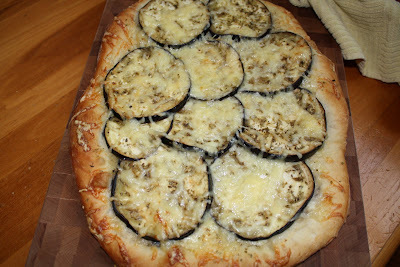 Layer on eggplant; top with 3 tablespoons oil, oregano and 1/2 cup cheese. Let stand 30 minutes. Give sheet a gentle shake to ensure dough isn't sticking. Carefully remove baking sheet from oven and slide focaccia onto sheet. Return to oven and bake until bottom of focaccia is crispy and edges are golden, 20 minutes. Serve warm or at room temperature. Looks yummy. I love eggplant. YUMMY!! Too funny... Eggplant is next on my Vegetable ABC list! Yay! !